Course tutor Zoë Booth will be joined by Mark Smith, course accompanist, to welcome you to a very exclusive Flutes at the Barns course - strictly limited to just ten participants - in February/March 2019. After a tasty supper, course activities will begin with a short introductory group session. On Tuesday morning the full range of activities will commence, with up to five sessions each day featuring a varied programme including a 45-minute individual flute lesson with Zoë for every participant, a private half-hour rehearsal with Mark Smith (plus top-up rehearsal on the final day), group sessions including workshops on repertoire, technique, interpretation and ensemble playing, small ensemble playing (some with coaching), and the chance to perform in informal participant concerts and/or a masterclass. Zoë and Mark will also perform in an exclusive tutor concert. The limited number of places on offer for this course allow for increased contact with the tutors throughout the duration of the course, including the longer time for individual lessons than on larger courses. On Thursday the musical activities will conclude with a friendly and supportive concert, where participants may choose to perform solos, ensemble pieces, in flute choir for the concert, or may simply enjoy supporting their fellow performers. Flutes at the Barns is delighted to welcome a visit from All Flutes Plus, a specialist flute shop based in Warren Street, London, who are friends of the courses and can provide the chance to browse music, accessories and to try headjoints and flutes of all sizes. In February/March 2019 we are excited to present the first opportunity to stay in Dale House, a new venue to Flutes at the Barns, and one which we are sure will become another firm favourite in the FATB calendar! 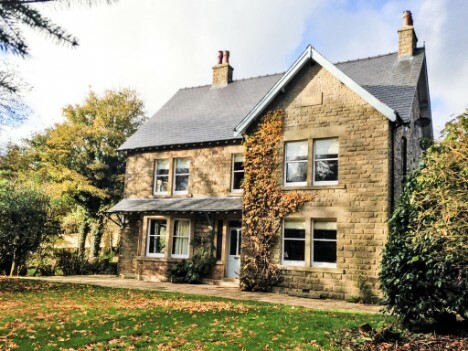 The wonderful location of Dale House is just a short stroll from the village green of Litton in Derbyshire, six miles from Bakewell and with easy access to the picturesque dales and stunning open countryside of the UK Peak District. The traditional stone farmhouse has plenty of light and an open and spacious feel for our music-making, with the combination of modern rusticity with original features offering a sense of warmth and cosiness. Our playing spaces include two roomy lounges - the log-burners can roar upon request - as well as the main studio which makes use of part of the dining area, with rich oak floorboards aiding the generous acoustic. An established and attractive garden surrounds the property on three sides, with plenty of car-parking also available. During down-time from music-making, the group can enjoy sociable meals together in the dining room, and refreshments will be served in the large Shaker-style kitchen; multiple comfy corners provide a chance for those FATB chats and laughs over a coffee, and maybe even a tipple into the evening. Once it's time to retire at the end of a satisfying day of flute (and more), each individual participant can enjoy a the peace of one of twelve stylised bedrooms (all participants are ensuite). Ten of the bedrooms are spread across the three floors of the main property, with two further self-sufficient family suites - in the style of luxury ski lodges - found in Dale Barn, just a few steps across the garden from the main house. In the morning, it will be hard to decide whether to enjoy the quiet alone-time of your private room, take an inspiring walk from the doorstep of Dale House, begin practising, or take your time enjoying a friendly and hearty breakfast; then the fun of FATB begins once again! £840 (£100 deposit payable upon application, balance due by Monday Monday 31st December 2018). The course fee is inclusive of full-board residential participation, all meals and refreshments. Nearest airports: Manchester or East Midlands (both just over 1 hour away). Nearest train stations: Buxton and Bakewell (each approximately 15 mins away), with Stockport tation 50 mins away. Partners are welcome to accompany flute participants and share their accommodation at a reduced cost of £415, taking full part in all except the musical activities. (Partners are welcome to attend and support their playing partner in any performances during the course.) If making an application with a non-playing partner, please note that the total deposit is £150.